Almost all Olimex boards are with simple 0.1" ICSP connectors. Microchip have decided to use a phone jack cable for their tools and boards which is huge in size. The new mini boards where space is critical can't use both of these, so we introduced the new ICSP-mini connector with a 0.05" step. 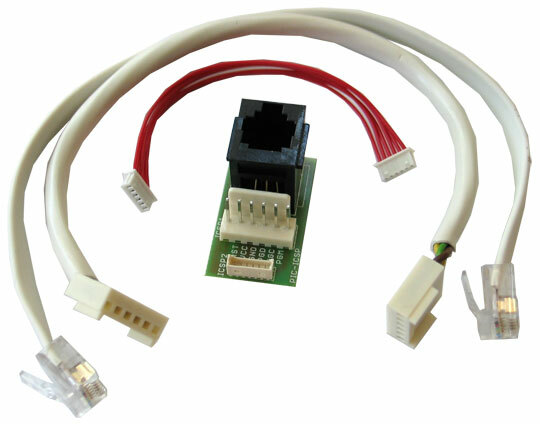 The PIC-ICSP is 3-way connector which allows bridging between development tools which use different connectors. IMPORTANT: the adapter is tested with Olimex-made boards and programmers. If you intend to use it with Microchip-made debuggers or boards make sure to trace the pinout. In order to be extra safe, please measure the VDD pin at the end of the cable. I use an official Microchip debugger and I have problems when using the PIC-ICSP adapter and an OLIMEX PIC board. The MPLAB acts as if there is nothing connected to my debugger. What is the problem? Probably the signal gets mirrored/reversed somewhere along the connection. I recommend you double check the pinout and maybe blindly try to change the orientation of a PIC-ICSP connector (or if there is an easier way - say at your debugger - do it at that point). If there is no other way to connect it in reverse - just carefully cut the ICSP connector's back side so you can connect it backwards.